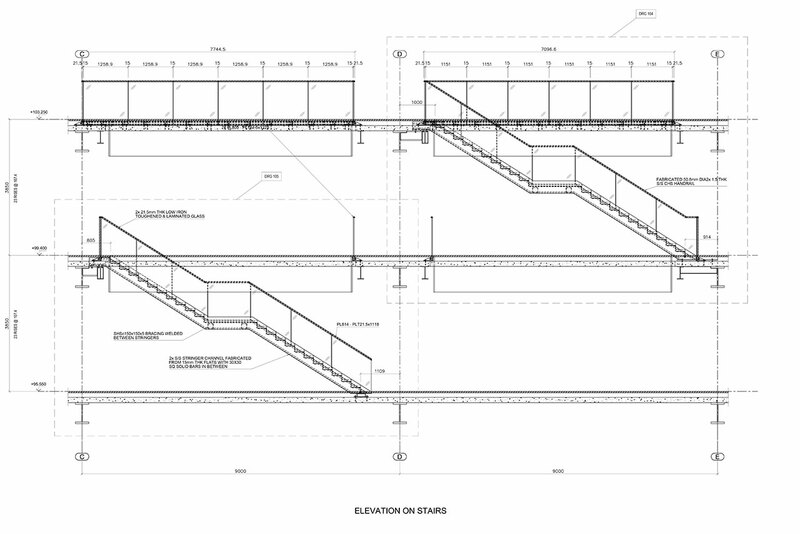 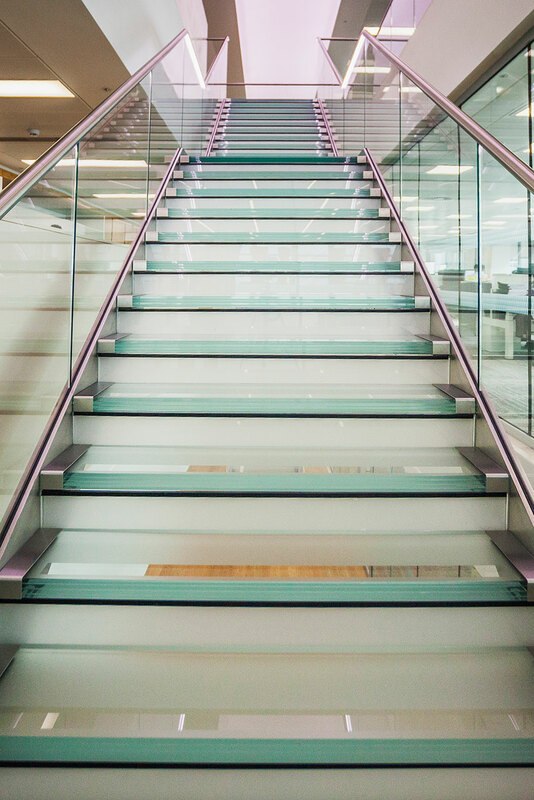 For this project Littlehampton Welding Limited fabricated and installed two staircases and balustrade, between levels 20 to 22 of Liberty Specialty Markets at 20 Fenchurch Street London. 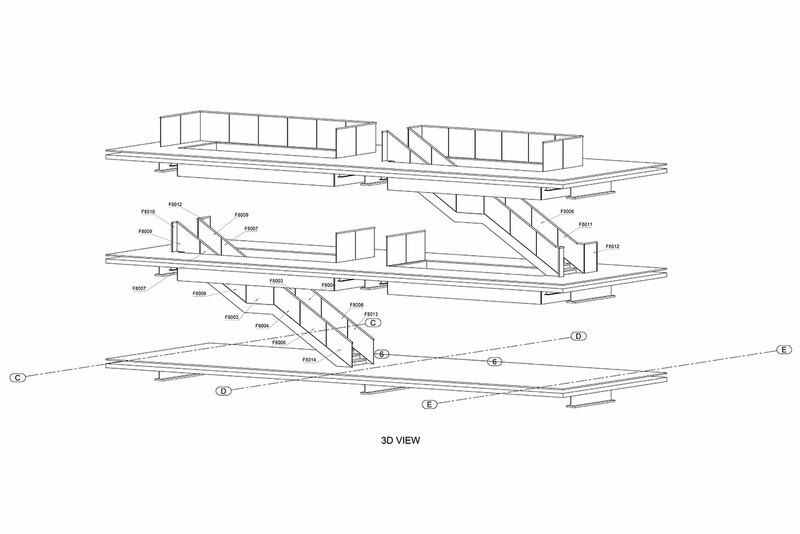 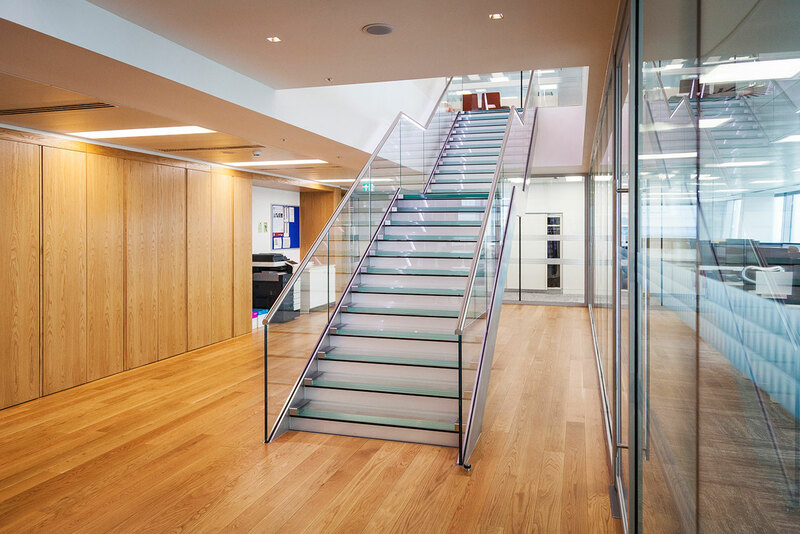 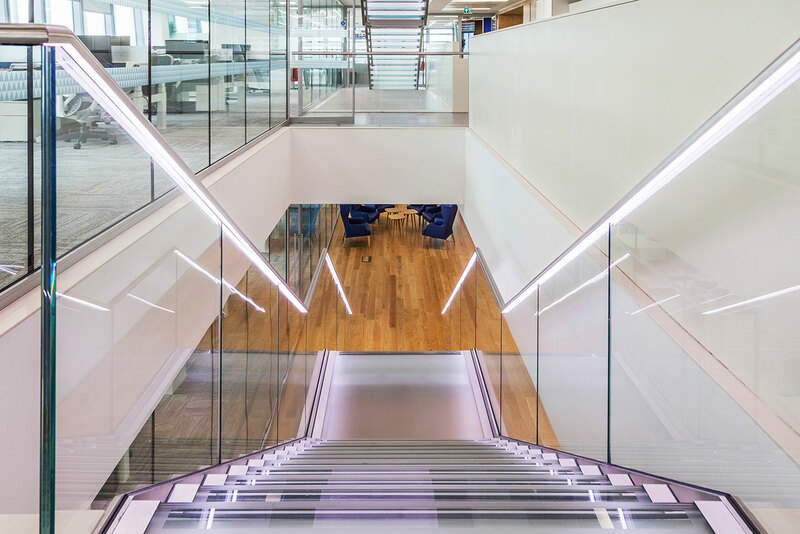 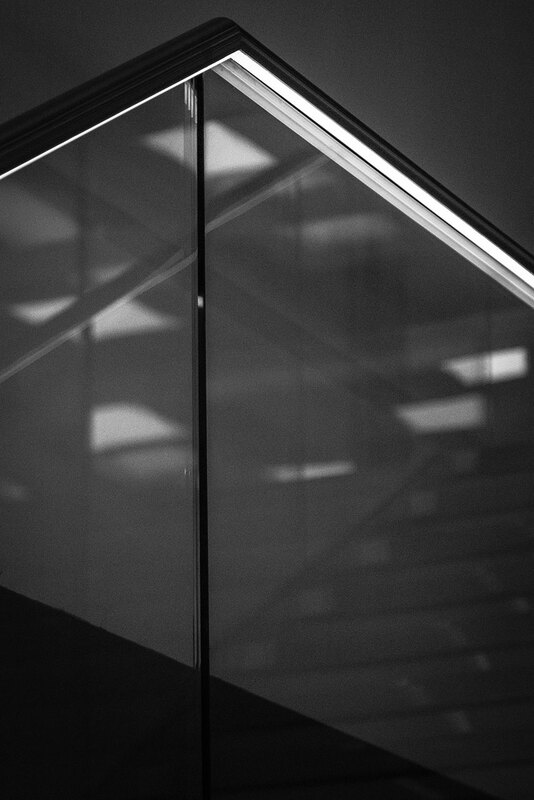 The office accommodates the staircases that provide access from levels 20 to 22. 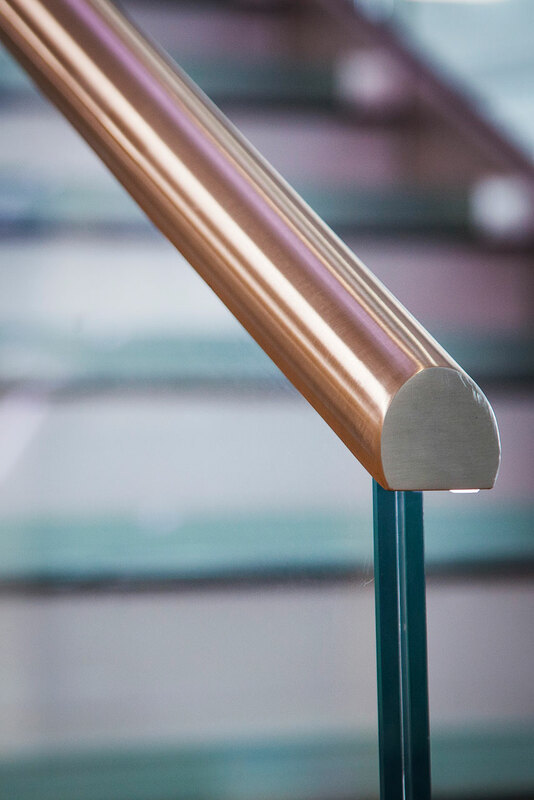 The straight stairs connect with intermediate landings and are fabricated from mild steel. 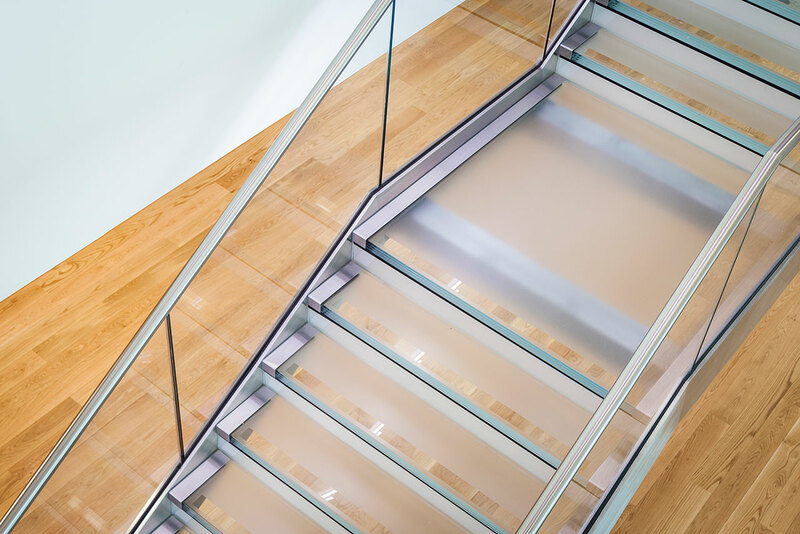 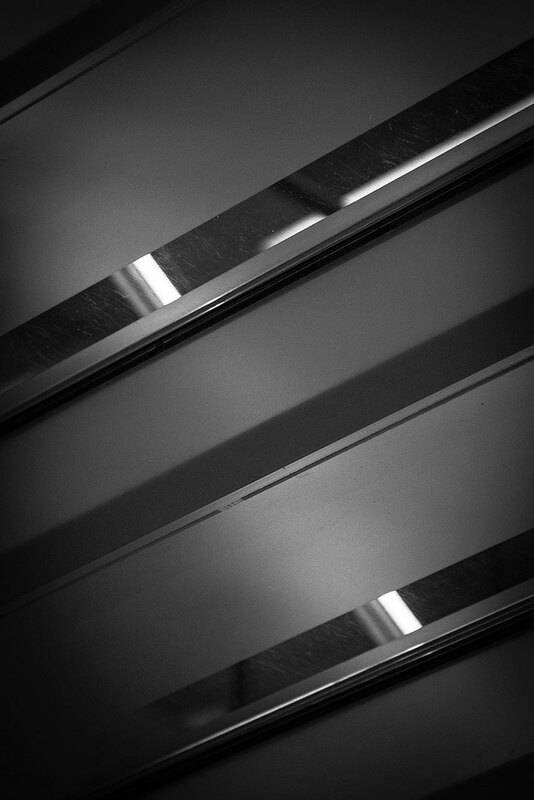 The treads are made from 48.67mm thick low iron, toughened, laminated and heat soaked glass which is sandblasted to provide a slip resistance and opaque finish. 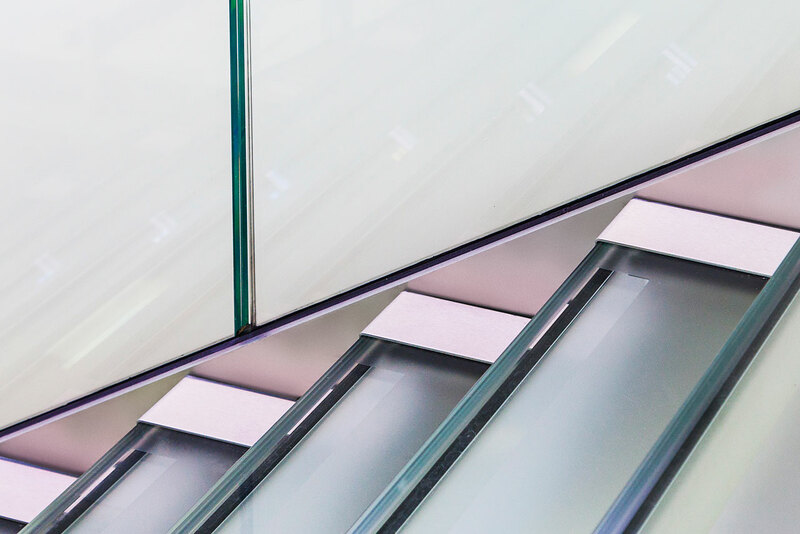 These are then adhesively fixed to the steel plate using CT1 structural glazing sealant (clear). 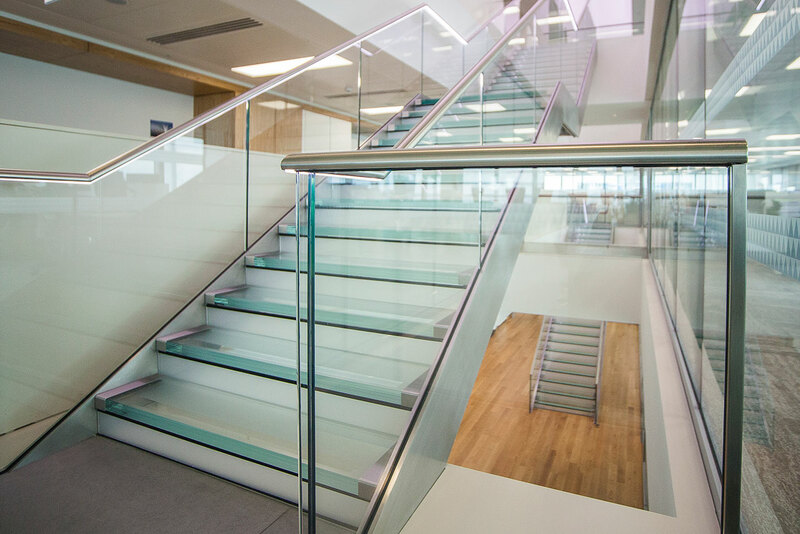 The risers are made from 12mm thick low iron glass and the tope riser back is painted pure white RAL 9010. 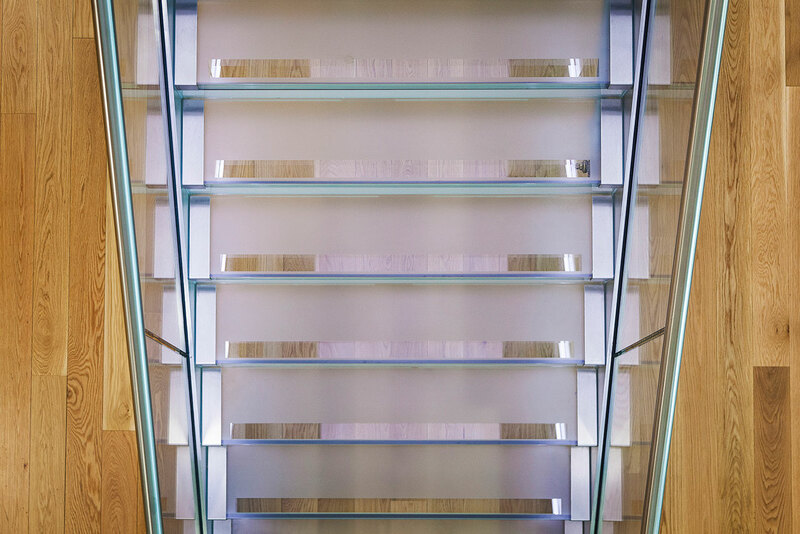 The glass balustrade panels are clamped between the flat plate and stringer with a satin polished stainless steel handrail. 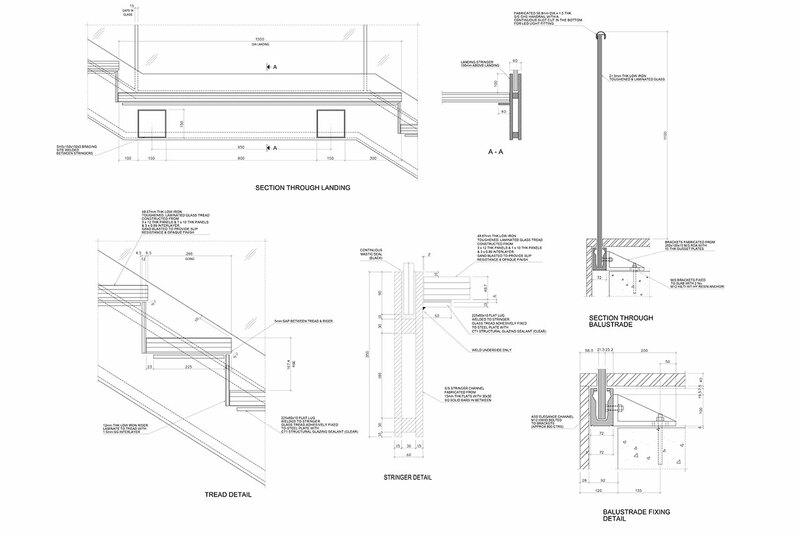 There is a continuous slot cut in the bottom of the handrail for LED lights, and the stairs are fixed to the slab using Hilti M12 Hit-HY 200 and M12 Hit-V resin anchor bolts and the top is fixed to the existing steelwork with M20 HXHD bolts. 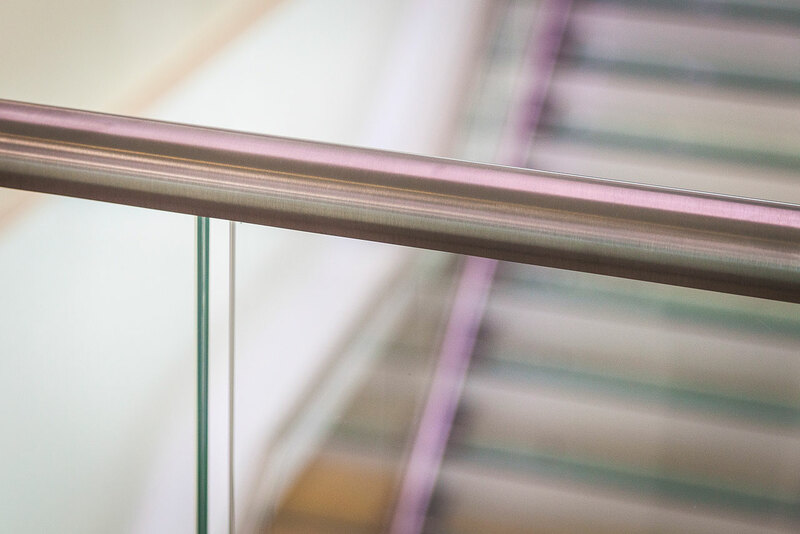 The balustrade around the stair openings are made from 21.5mm thick low iron toughened, laminated and heat soaked glass with grade 304 stainless steel satin polished 50.8mm x 1.5mm thick diameter handrails. 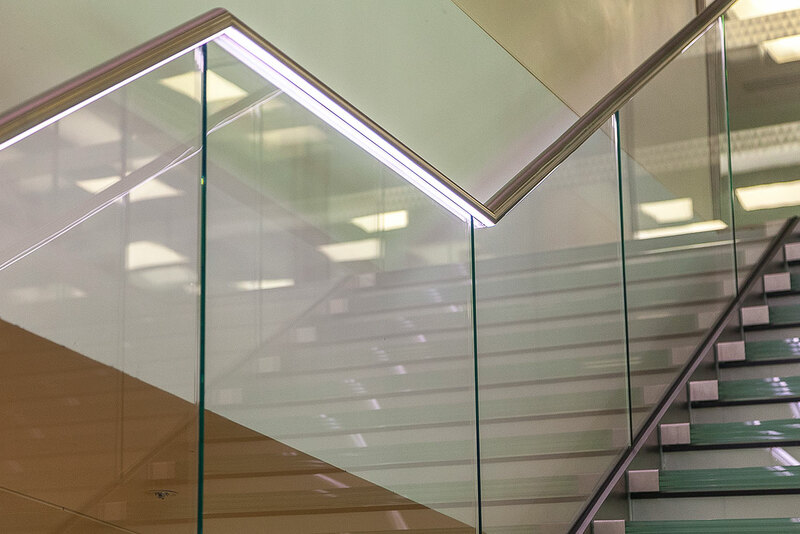 The glass is clamped in place using ASD Elegance channel system which is fixed to the slab via brackets with M12 Hliti Hit-HY resin anchors.